"As promised, I am sending you the introduction of our newest speaker line unveiled this weekend at the Audio Video show in Warsaw/Poland. We call it Overture, the beginning of something more exquisite. The range consists of five models: one centre channel, one monitor and three floorstanders. We developed a special type of protective grill which unlike conventional solutions doesn't distort the sound. Each speaker comes with two detachable front panels, one of which is cloth covered. You get exactly the same sound, tonal balance and overall clarity with or without these cloth-covered versions." "The tweeters of this range are loaded with a deep waveguide. This raises their sensitivity in a critical region and unloads the drivers themselves to net measurably lower THD. All Overture models are available in an expanded array of exciting finishes - gloss colours, textured gloss never seen before and classic veneers, all protected by a scratch-resistant coating." 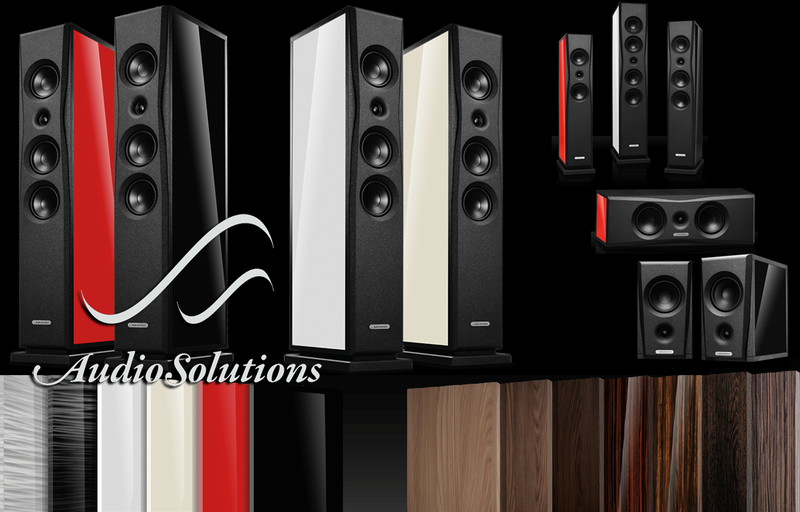 The sender had signed as Gediminas Gaidelis, owner and chief designer of AudioSolutions in Lithuania. Should your geography be too hazy to know where that is, our map shows it be on the Baltic sea sharing borders with Russia, Poland, Belarus and Latvia. For review, I decided on the smallest floorstander. Its F3 or LF reach is off by just a few cycles relative to the 2.5-way 5-driver flagship. Just so it is shorter and lighter on eye, back and wallet by 11cm, 11kg and €910, then a pure d'Appolito 2-way with a simpler 2nd-order crossover which goes easier on complexity and drive requirements. Whilst the alphanumeric O203F name is unimaginative to the extreme, prior AudioSolutions reviews in these pages show that Gediminas does have plenty of imagination when it comes to speaker design. Rather than cater to the nouveau or ancienne riche, our man in Eastern Europe prefers more regular folks. To him, value is no dirty word but a sparkler. That rings my bell. Ka'tching. 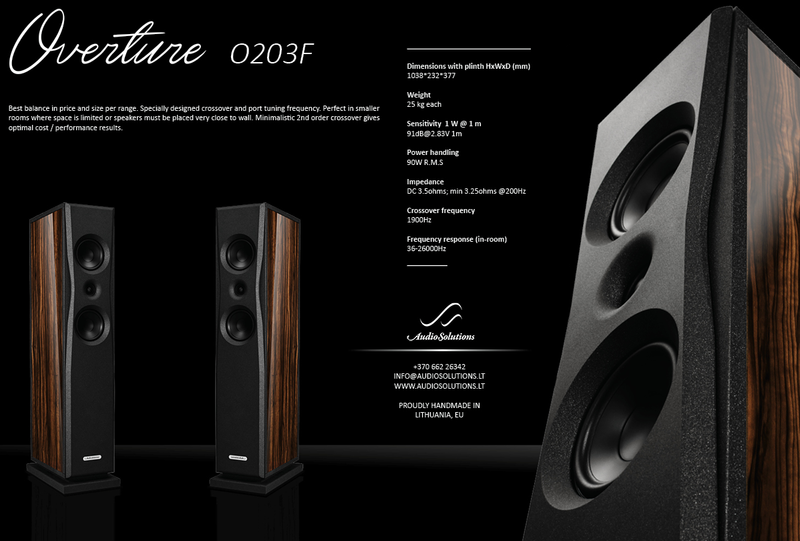 Here the Overture range replaces the company's previous entry point of the Euphony models. For the O203F, it means "highly braced CNC-precision MDF construction up to 36mm thick; a high-flow bass reflex port; a linear impedance crossover of point-to-point makeup; biwire binding posts; and a 25mm silk dome tweeter with two 150mm classic paper-cone mid/woofers." I asked Gediminas what else he could tell us about this model in particular; and about his decision to retire the entire Euphony range.